Since 2006, Piscines P. Massie has made a name for itself thanks to its extensive expertise with in-ground pools. We’ve installed over 1000 pools to date. Choose the model that best suits your backyard, from our vast selection of in-ground pools. The team at Piscines P. Massie takes care of every step, from A to Z. Does your pool liner look worn or damaged? Let us replace it. Whether you need to buy, install, repair, open or close an in-ground pool, the team at Piscines P. Massie will handle it for you. 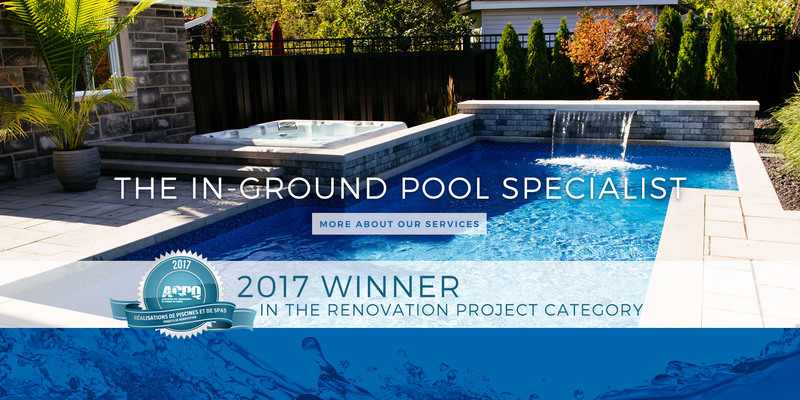 We’ve developed proprietary installation methods and standards to build you a tailor-made in-ground pool that’s top-quality and highly durable. Get inspiration from some of our favourite projects. Treat yourself to an in-ground pool that will make the whole family happy. We’ve completed over 1000 projects to date!